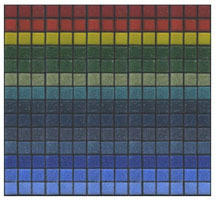 Similar in style and color to our stocked Aventurine, Classic, and Luster series ¾” tile. Ideal for artistic uses. Each color sold individually; bulk packed in 40 lb. cartons. For more information, samples, or to place an order, please email info@hakatai.com or call 888-667-2429. Tile size: approx. 3/8" x 3/8"
Please note: Computer monitors vary in how they show color. Photographic lighting can also affect the look of tile. We strongly recommend ordering a sample board before placing an order.